I’ve never cooked these before but an article in a magazine I read yesterday reminded me to try them. And now you’ve made them too. It must be a sign! 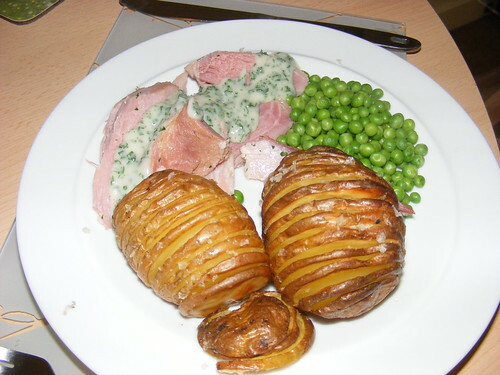 I love hasselback potatoes – we always used to have them with sunday dinner when I was a child, but never made them myself. Fond memories. I never would have thought to do that to a potato. Will give it a try tonight. Looks wonderful! Sorry, this is the potato I love! Hasselback yep, invented at the Hasselback hotel in Stockholm. Hasselback = hazel hill. Just dropping by to see if you have a good casserole recipe because after the wonderful shepards pie I am ready to branch out! Hi! Try scattering a few breadcrumbs on top before roasting- I believe that’s part of the original recipe- makes them looks even tastier & different! I prepared them. I used breadcrumbs as a topping (after baking for 20 mins). They were absolutely fabulous. This looks very yummy and they seem really easy to cook! ooooooo…just browsing around..it’s midnite here in okinawa and my kids are down for the nite and the hubby is passsed out in the parlor floor from studying the pass 2 weeks…he has a big dive instructor’s test 2morrow, so i need to wake him in a few..saw this recipe and made it. tastes soo good and it’s soo simple..having it with orion beer. 2morrow’s saturday so i don’t need to get up and go anywhere………..great recipe….mahalo! Wow, those look amazing! And to think that it is that easy is just crazy. I definitely will be making these some day. I like the photo as well, certainly better than I could do! ooooo good! my mother used microwave a potato then cut it in half, score it and add cajun spices before popping it in the oven for a bit to crisp it up. Probably good for serving guests; they look all fancy and don’t require a day’s work. I really like hassebacks potato. Even though you are not making something very special it tastes different. Ok, I have just GOT to save this recipe. Looks terrific! I really like mine with fresh grated high quality parmesan cheese…it creates a bit of a crunchy crust on top! It ain’t proper hasselbackspotatis if you don’t peel them. the picture doesn’t look anything like real hasselback potatoes. OMG the potatoes really look delicious! Getting hungry while i look on your post! yum yum yum! makes the best basselback potatoes. He put two chop stickes either side of the halved potato and then slices. This means you can’t slice all the way through. He also alway peels them. A must!!! The picture made my mouth water. What a novel idea for a variation on the traditional baked potato. Guess what we will be having for lunch today. These look amazing, I can almost taste them just from the photo. Great tip about using a spoon to prevent cutting all the way through! Brilliant with grated cheese and onion.